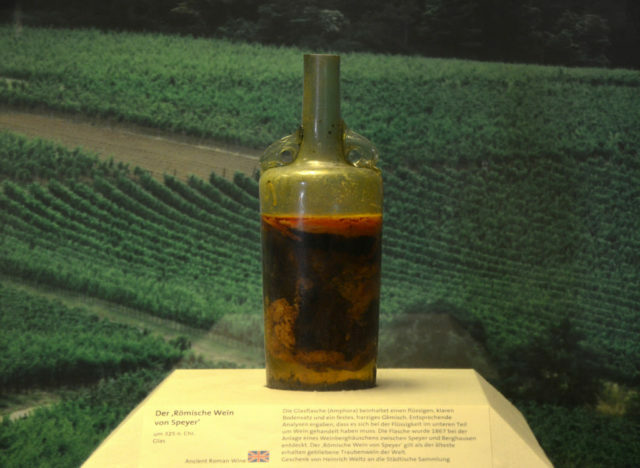 Historians have split opinions on whether the bottle should be opened or not. This extremely rare artifact is 1,650-years-old and it is placed in the Historical Museum of the Palatinate in Germany. The glass amphora has handles in the shape of dolphins and is sealed with wax. The contents of the bottle is about one-third olive oil which in the past was used as a preservative that prevented the wine from oxidizing. 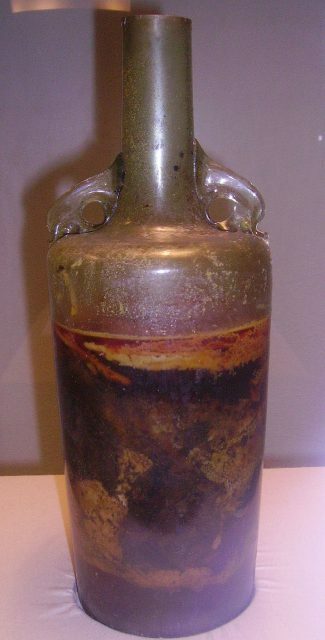 The Speyer bottle was found in the grave of a Roman nobleman in 1867, in the Rhineland-Palatine region of Germany and caused a real stir among historians and archaeologists at the time. Reportedly, the tomb near the city of Speyer also contained the sarcophagi of his two spouses. 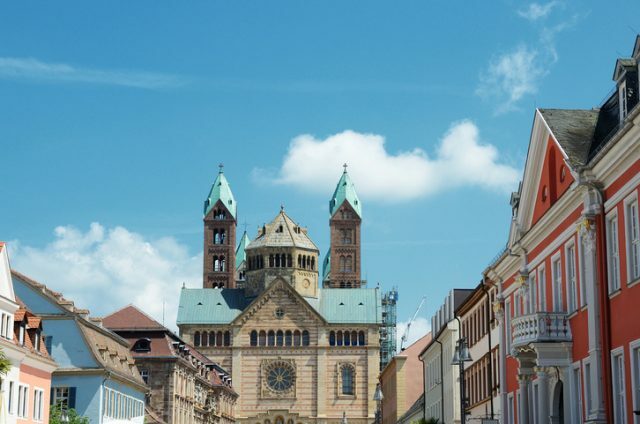 The antique bottle, which represents thousands of years of human history and customs, was named after the city of Speyer. In the glory days of Ancient Rome, wine and wine cults were diligently observed. One of the inventions of Hero of Alexandria, an engineer who was centuries ahead of his time, was a delightful party centerpiece that seemingly turned one liquid into another. His trick jug incorporated two separate, sealed compartments and some clever pneumatics to make it seem that water added to the vessel was dispensed as wine. This is one of several similar devices that Hero describes in his Pneumatica. 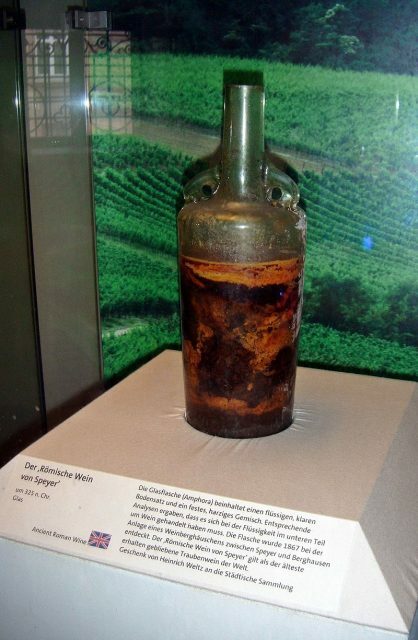 During WWI, a chemist analyzed the Speyer bottle but never opened it so the wine was given to the Historical Museum of the Palatinate collection in Speyer. Over time, numerous scientists have hoped to obtain permission to analyze the bottle’s contents thoroughly, though nobody has been granted one yet. 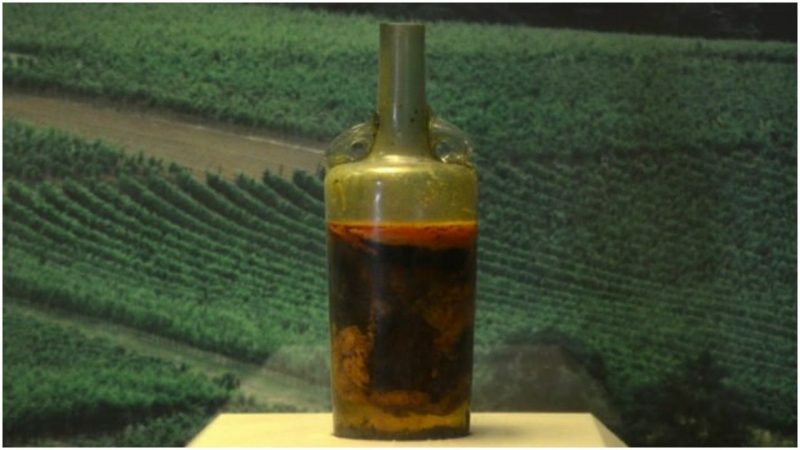 Some scientists and microbiologists are adamant that the bottle shouldn’t be opened, among them Ludger Tekampe, the curator of the Folklore Wine Museum collection. “We are not sure whether or not it could stand the shock to the air. It is still liquid and there are some who believe it should be subjected to new scientific analysis but we are not sure.” said Tekampe on the matter. This rare artifact of the ancient world was created during the early days of the tradition of wine production and consumption, which was begun by the ancient Greeks. The tradition was later embraced by the ancient Romans, who also took Dionysus, the Greek god of agriculture, wine, and fertility, and renamed him Bacchus.